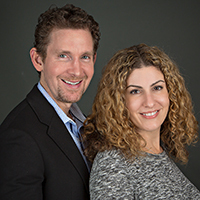 Dan and Amy Schuman are well respected, top agents in the areas they serve. More important to us than our numbers is that our level of expertise allows us to do what’s most rewarding - help people. We’re never "pushy" or aggressive with our clients, but we are aggressive when it comes to getting them what they want. Being a husband and wife team gives us the "power of two". Our clients get two professionals each with specialized areas of expertise and unique personalities. Luxury homes are our forte. We apply our specialized training and experience in distinctive home sales to help you successfully buy or sell - no matter what your price point. Our associations allow us access to marketing resources not available to most agents. We enjoy helping clients by being a good resource for them. Whether someone needs to find a doctor for their children, a good handyman, or just needs the name of a good local restaurant, we’ll be there to lend a helping hand. In fact, many of our clients become our friends, which is one of the greatest rewards of our profession. Dan has over 17 years experience in the real estate industry and has been involved in over 2000 transactions. In addition to being a pricing specialist, Dan also holds the prestigious E-Pro designation, making him one of the area’s leading experts in the area of internet marketing. The internet is the fastest growing and most essential marketing tool today and his proficient insider’s knowledge makes all the difference in successfully marketing homes for our sellers as well as finding just the right home for our buyer clients. We work with a fairly sophisticated clientele that demand a high level of hands-on service. Therefore, we typically work with only a limited number of buyers and sellers at any one given time. Our focus is to always look out for the best interests of our clients. We also seek to continuously educate ourselves in order to stay ahead of the curve in an always evolving real estate industry. Being a husband and wife team gives our clients two full-time professionals each with specific areas of expertise and unique personalities. We both specialize in luxury homes and apply our training and experience in distinctive home sales to help you successfully buy or sell - no matter what your price point. Our associations allow us access to marketing resources not available to most agents. Although we are business-minded, we do appreciate the personal side to our profession. We thoroughly enjoy helping our clients by being a good resource for them. Whether someone needs to find a doctor for their children, a good handyman, or just needs the name of a good local restaurant, we’ll be there to lend a helping hand. In fact, many of our clients become our friends, which is one of the greatest rewards of being in real estate. Amy is a 2012, 2013, and 2014 National Sales Excellence recipient and recognized as one of Howard Hanna's "best of the best". She is also a professional Home Stager. To get top dollar in any market, your home needs to be presented at its best and Amy’s proven Staging techniques do just this. Our listings sell quicker than the average listing. It's one thing to watch a show on HGTV, but there is no replacement for the services of a professional. Amy's other interests include reading, crossword puzzles, cooking, wine and photography.